Amazing faculty, innovative technology, and clinical education that’s second to none. Be part of something special at MBKU's SCCO and experience all this and more. You’ll also become part of a tightly knit academic family, including an alumni group that’s among your chosen profession’s most accomplished researchers, clinicians and teachers. We had a different name when Dr. Ketchum first opened our doors. But today, more than 100 years later, you’ll find the same high standards for academics, clinical skills and professional development alive and flourishing here on our beautiful Southern California campus. Learn more about our admissions process and requirements or about what it’s like to be a student at MBKU. 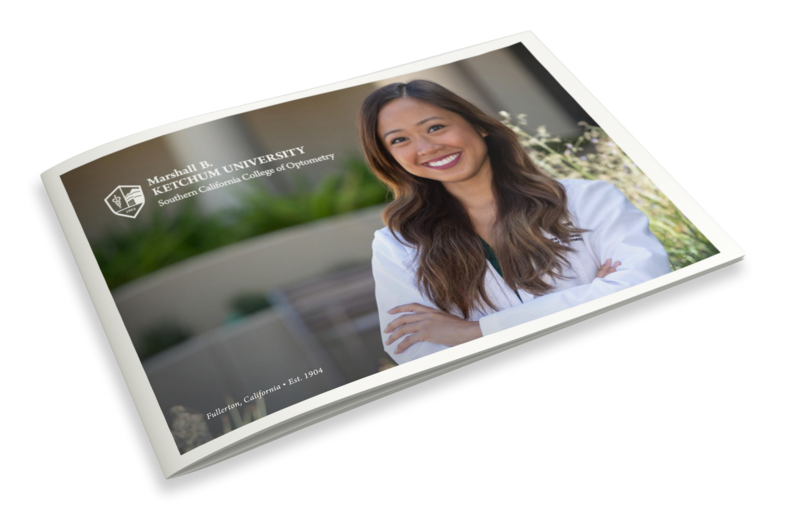 The SCCO Admissions Brochure provides a brief overview of the Doctor of Optometry program at Marshall B. Ketchum University. This brochure equips prospective applicants with helpful insight into various aspects of the program and admissions process, such as prerequisite requirements and what the admissions team looks for in a competitive applicant. We are the first health care university in Southern California to bring three primary care disciplines together to learn and work as a team to provide collaborative, effective patient care. Together, our optometry students, our PA students as well as our pharmacy students are able to connect first-hand in an interprofessional learning and clinical environment. SCCO’s fourth-year rotation program allows students to customize their final year of education to their personal interests and professional goals. We offer over 80 outreach sites all over the country, each with its own patient demographic providing students with a unique fourth-year experience. Student interns complete four 3-month rotations, one at the new University Eye Center at Ketchum Health Anaheim and three other locations of their choice. The OD degree granted from Marshall B. Ketchum University is a professional doctorate degree. There are academic degrees offered as well. The academic degree offered at MBKU is the master's degree in vision science. It may be completed concurrently with the doctor of optometry degree. With the growing number of optometry programs in the U.S. over recent years, there has been an increase in demand for qualified academics in the field. Establish your health care career with clinical and educational excellence. Explore the program by clicking the links below.